"Maria Theresa Chandelier Crystal Lighting Chandeliers Lights Fixture Pendant Ceiling Lamp for Dining room, Entryway , Living room Dressed with Large, Luxe, High Quality Diamond Cut Crystals! 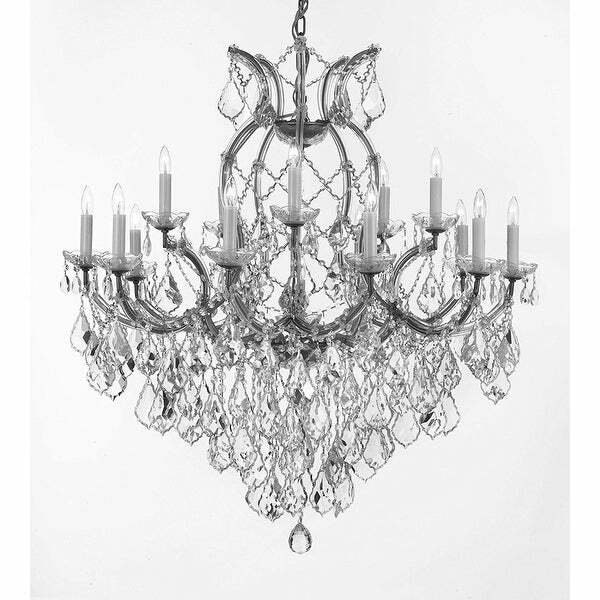 H38" X W37"" This beautiful Chandelier is trimmed with High Quality Diamond Cut Crystal. A great European Tradition. Nothing is quite as elegant as the fine crystal chandeliers that gave sparkle to brilliant evenings at palaces and manor houses across Europe. This two-tier version from the Maria Theresa collection is decorated with crystal that capture and reflect the light of the candle bulbs, each resting in a scalloped bobache. The timeless elegance of these chandeliers is sure to lend a special atmosphere in every home. Assembly Required 16 LIGHTS Lightbulbs not included Please note, when you purchase an item from the Gallery you can be assured of the ""Gallery 4 Points of Confidence"": 1. Each item comes with a Certificate of Authenticity, certifying this product is an authentic Gallery lighting fixture. 2. Each item comes with a Gallery backed warranty (Established 1978). 3. Each item will include Gallery verified and approved diagram and instructions. 4. Each purchase is provided with a toll free number for free Gallery tech support. Requires (16) 40 Watt candelabra base bulbs (E12) - not included. Not UL. Dimensions 37.0 In. X 37.0 In. X 38.0 In.